These lesions imply tracheal wall involvement and caving of the tracheal cartilage. Endoscopic treatment is not easy. Dissection with the rigid bronchoscope often provides immediate gratification, but recurrence in less than 10 days is common. We usually prescribe steroid inhalers and nebulized epinephrine in order to reduce post-treatment inflammation. High tracheal stenoses are difficult to treat due to the proximity of the vocal cords. 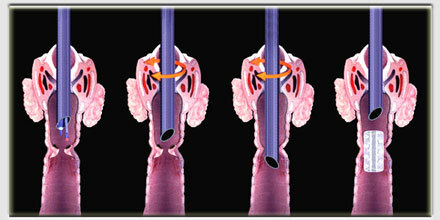 Sub-glottic stents placed just below the vocal cords are generally poorly tolerated. That notwithstanding, stent placement is often necessary in order to treat this type of tracheal stenosis. The stent may be deployed following dilatation with the rigid bronchoscope which in turn may be preceded by laser resection (high power settings and short intervals), or radial incisions. These two films illustrate the importance of dilatation prior to stent placement. Generally, the larger the stent diameter the better (14, 15 or 16 mm diameters are best). The length of the stent, on the other hand, should be the shortest possible (50-60 mm is generally sufficient).